As soon as my husband found out that we were pregnant with our second child (yep, it’s official! ), he started making the necessary plans. Because he’s a smoker, one of those plans is spending more time indoors and less time smoking outdoors. 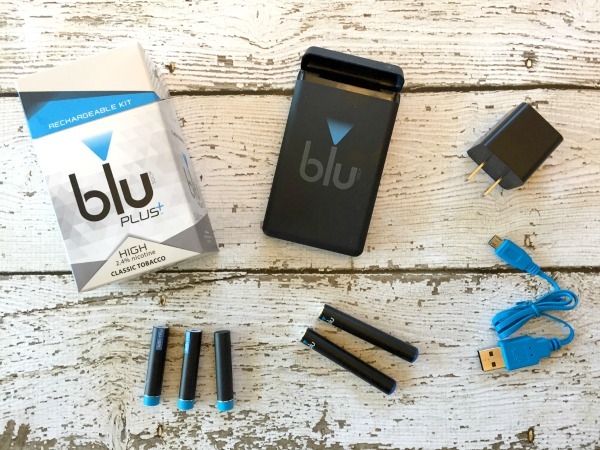 Enter the blu PLUS+™ Rechargeable Kit. Also enter my hubby, who’s today’s guest blogger. Yes, we’re pregnant. I know it may be annoying to some when men say “we” are pregnant, when it’s the woman who does all the hard work with the actual “being pregnant” part. But, it’s a team effort, and one of my many contributions to the process will be cutting down on the amount of time I spend puffing on cigarettes outdoors. 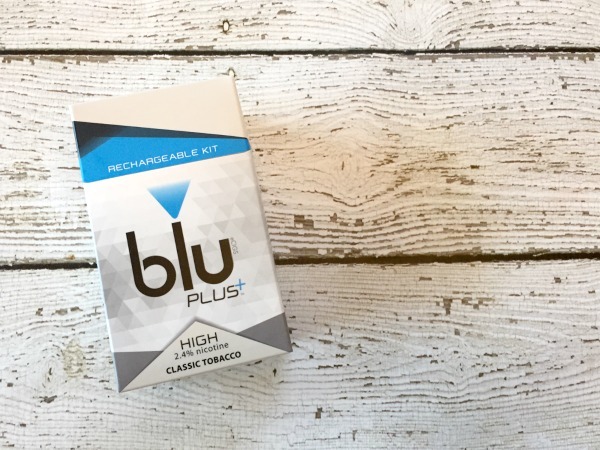 I’ve been thinking about making the switch to electronic cigarettes for a while and I recently got the chance to do that when we were chosen to do a review for the blu PLUS+ e-cig Rechargeable Kit™. Ordering the blu PLUS+ Rechargeable Kit couldn’t have been easier. Just a quick visit to the blu website, and my rechargeable kit was on its way. Yes, my days of smoking regular, stinky cigarettes were numbered. A few days later, my blu PLUS+ Rechargeable Kit had arrived. I tore into the box like a kid at Christmas, eager to test my new toy. RECHARGEABLE PACK – This is the main battery that charges the rechargeable battery in your e-cig (it only takes 30 minutes). The pack can also be used to hold your charged e-cig and your extra flavor tanks. RECHARGEABLE BATTERIES – You get two of these, so you can keep one fully charged while you’re using the other one. The improved battery lasts twice as long and charges twice as fast as the previous blu Rechargeable Kit battery. FLAVOR TANKS – The kit comes with three flavor tanks. These pre-filled tanks are what holds the flavored liquid that’s turned into vapor. 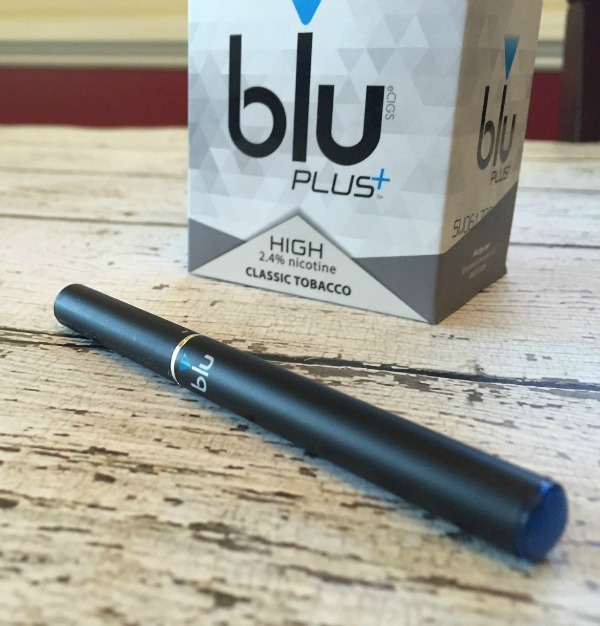 They deliver consistent flavor and they’re super easy to use – just screw them onto the e-cig and start puffing. They’re longer lasting than other tanks and they come in four different flavors (Classic Tobacco, Menthol, Cherry and Vanilla). 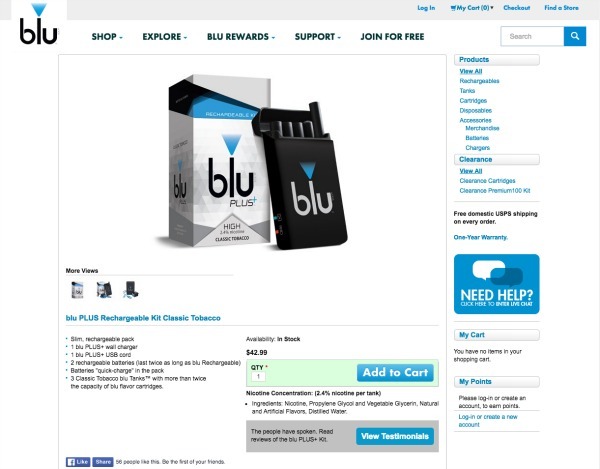 You can even get them in different nicotine levels (high, medium and none). WALL CHARGER – You can charge your Rechargeable Pack with this wall charger, but you can also charge it with your computer. USB CABLE – This is what connects your Rechargeable Pack to either your wall charger or a computer. Once everything was unpacked and charged, it was time to test my blu PLUS+ Rechargeable Kit for the first time. 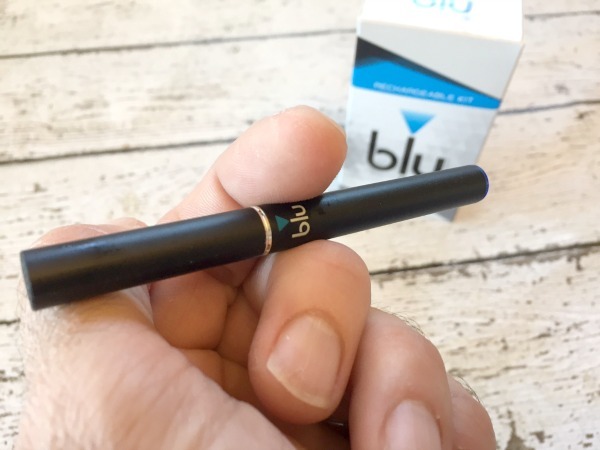 The first thing I noticed was the improved tip of the e-cig, which does a great job of mimicking real cigarettes, both in terms of the draw and the feeling in your mouth and throat. The tip also creates more vapor and creates a taste that really does taste like a cigarette, but without the funky smell of cigarettes. I’ll be the first to admit that smoking real cigarettes isn’t all that “cool,” but e-cig’s are a different story. The look of this thing and the way the tip glowed blue every time I puffed on it made me feel like some sort of futuristic bounty hunter named Thor3000 who was sent back in time to capture some bad guys. And I also felt cool because I was no longer ducking outside 10 times a day to smoke cigarettes (that’s over an hour a day of LOST time!). I could take a few puffs of my blu PLUS+ here and there and get that hour back to spend more time with my wife as we haggled over names for our future son or daughter. Now that I think about it, I’m kind of a fan of Thor for a boy, but ten bucks says she’ll veto it. For updates and news about new products and others cool stuff, feel free to follow blu on Twitter, Facebook or Instagram. My brother vapes, and I have no clue if this is the same thing, but I will tell him about this. What an interesting product. I am all for someone quitting and getting into better health for their family. The vapors are so much more pleasant to be around than having to smell cigarette smoke. I am so glad they came up with them over regular cigarettes. Your Blue + are kind of futuristic looking. Congratulations on the baby! Congratulations on your soon-to-be new addition to the family! And good luck with kicking the habit! Congrats! And you’re right – it’s a team effort. Everyone has to make their sacrifices or whatnot. Kudos to you for thinking of making the switch. Congratulations on your new addition to your family. My friend who uses this brand of E- cigarettes swears by them. That’s great that he’s making the switch up for the new arrival! Congrats! I don’t really know anything about vaping. You know how guys always give out cigars when their wives have a baby? Here’s to e-cig’s replacing cigars as the new gift of choice!!! It’s nice that your making a change in smoking habits to spend more time with your wife during pregnancy. Congrats on the new baby. I’m glad that you made the switch. I didn’t realize it had the same mouth feel and that kind of thing. That has to help. Congratulations! Glad to see your husband is on board by switching to e-cigs. I have known a few people who have used these. They seem to like them.